June Jackson Biography - background information. My name is June and I am a plump, old, grey wrinkly now living in Devon after over thirty years in the south of England. I decided to create Hints and Things in 2000 to provide some of the information that used to be passed down from generation to generation. Hints and tips on a variety of subjects; explanations of basic cooking, knitting, sewing, DIY, motoring and gardening terms; advice on cutting costs etc. In fact the things you might ask your Mum, Dad, Gran or Granddad. Add to this games, brain teasers, fictitious collective nouns (as well as authenticated ones), mathematical shortcuts, wordplay and, hopefully, it is a site that is not only useful and informative but also enjoyable. 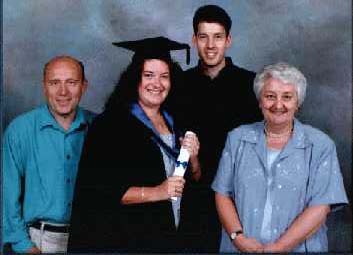 From right to left, me, my son Carl, my daughter Sally and her husband.